Welcome to the CN/Wisconsin Central General Committee of Adjustment of the Brotherhood of Locomotive Engineers and Trainmen (IBT). and safety of its members through solidarity, aggressive representation and education. Site Goals: To keep the membership informed. We are pleased to now make available our Member Services portion of this website to CN/WC BLET General Committee Members. To access these services please click the above LOGIN button and click the Register Here line, fill out the form and follow the instructions. If you have previously registered on www.blet174.org, you already have access to this system using you work PIN as the username. Any issues or questions using this system should be directed to the website administrator at: admin@bletcnwcgca.org to have them resolved. Thank you for your patience during this process and while I approve users into the system. Monday March 9th signed so-called right-to-work legislation banning requirements that private-sector workers pay union fees. In a matter of weeks, Republicans pushed through the measure making Wisconsin the 25th state with such a law, giving a victory to manufacturers in the state and a blow to organized labor and some construction firms, which had opposed the measure. 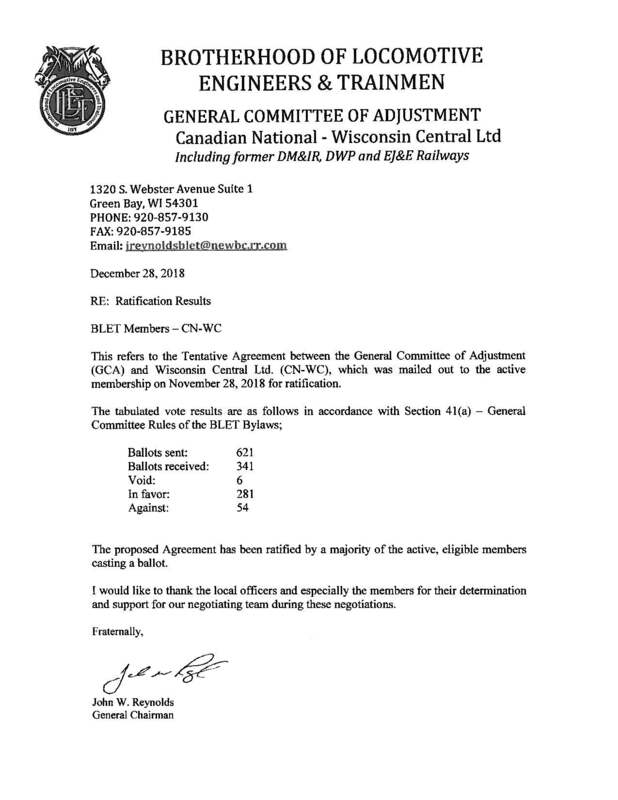 This refers to the tentative agreement between our GCA and Wisconsin Central Ltd. (CN­ WC), which was mailed out to the active membership during the month of June, 2014 for ratification. The U.S. Department of Transportation’s Federal Railroad Administration (FRA) today announced its intention to issue a proposed rule requiring two-person train crews on crude oil trains and establishing minimum crew size standards for most main line freight and passenger rail operations. The FRA also intends to advance a rulemaking on train securement and recommends a rulemaking on the movement of hazardous materials. As you know in probably the biggest on-going issues we are dealing with in your areas is managers on trains, excessive hours on duty, the position the Carrier is taking on limbo time and the Carrier’s on-going violations of the CBA. First, I want everyone to know that no one is sitting idly by and taking these issues lightly. Below I will describe what we are doing to address the above mention on-going issues. The Transportation Safety Board of Canada (TSB) will release three recommendations related to its ongoing investigation into the 6 July 2013 derailment and fire involving a freight train operated by Montreal, Maine & Atlantic Railway in Lac-Mégantic, Quebec. The U.S. Department of Transportation’s Federal Railroad Administration (FRA) today issued an industry-wide Safety Advisory to help ensure railroads adhere to federal regulations regarding maximum authorized train speed limits. The advisory contains four recommendations to ensure railroads comply with speed restrictions through appropriate operating policies, procedures and effective implementation. It has been reported that Grade Crossing and Trespassing Fatalities have been on the rise recently according to “Operation Life Saver” and the Federal Railroad Administration (FRA). This seems to be consistent with the amount of contact I have had with CN/WC GCA Members who have been involved in Critical Incidents over the last several months. The “Your Track to Health” brand represents the wide array of health and welfare benefits and resources available to eligible Railroad employees and their dependents. Whenever you see Your Track to Health used on communications and in materials, you can know and trust that the information is important and is being provided to help you better understand and optimize your health and welfare benefits. Please see the attached letter concerning the vote results of the Mediation Agreement A-13676. Thank you for everyone who voted. The U.S. Department of Transportation’s Federal Railroad Administration (FRA) today issued an Emergency Order and Safety Advisory to help prevent trains operating on mainline tracks or sidings from moving unintentionally. The FRA’s announcement was made in response to the July 6, 2013 derailment in Lac-Mégantic, Quebec, Canada, as it awaits additional data once the investigation into the crash is complete. The actions announced today build on the success of FRA’s rigorous safety program, which has helped reduce train accidents by 43 percent over the last decade, and made 2012 the safest year in American rail history. The following is the official statement from Dennis R. Pierce, National President of the Brotherhood of Locomotive Engineers and Trainmen regarding the danger to public safety that one-man train operations represent. Please see the attached letter concerning the Company's Section 6 Notice that was in the mailing of the Tentative Mediation A-13676 Agreement. I have been notified by many members with concerns of the Company's Section 6 Notice dated August 31, 2012 that was enclosed in the mailing of the Tentative Mediation A-13676 Agreement Package. Many members have the impression that the Company's Section 6 Notice is part of the Tentative Mediation A-13676 Agreement. THIS DOCUMENT IS NOT PART OF THE TENTATIVE MEDIATION A-13676 AGREEMENT. Ballots will be counted on August 9, 2013. If any active members do not receive their Tentative Agreement package by July 8, 2013 they should contact the General Committee office at (920) 462-4509 and a Tentative Agreement package will be mailed to them. Included in the package are dates and locations for contract explanation meetings. In addition to the meetings there are four conference calls scheduled. These meetings and conference calls are for the member's benefit to gather information and ask questions they may have concerning the Tentative Mediation A-13676 Agreement before casting their vote. BLET Editor's Note: The following is a list of important Information for railroad employees eligible for GA-46000 who may be planning an early retirement. It was prepared by United Healthcare. Please see the attached letter concerning a request to not be called on your rest days. This should eliminate unwanted/disturbing calls from CMC. If a member signs up for the do not call list and is called, please notify your local officer so notification can be made of the General Chairman. As you all should already know, the Carrier has announced Attendance Guidelines to take effect on May 24, 2013. I fully understand that our members have many questions, concerns and fears about this policy and how it will be administered. The purpose of this letter is to let all of you know the GCA's position in this regard. The Brotherhood of Locomotive Engineers and Trainmen enters its 150th year on May 8, 2013. It is the oldest transportation labor organization in North America. Founded May 8, 1863, at Detroit, Mich., the BLET has its headquarters in Cleveland, Ohio. It has more than 500 Divisions (locals) throughout the United States. The first unit of the Brotherhood to be formed was Division1 in Detroit, Mich., on May 8, 1863. Internal Revenue Service regulations require the BLET National Division to inform its members that a certain portion of your National Division dues are not tax deductible as a miscellaneous itemized deduction on your personal tax returns. According to the National Secretary-Treasurer’s office, 84.2 percent of your BLET National Division dues are tax deductible on a Form 1040 tax return. Unionists have never enjoyed true security in America. During the early nineteenth century, they got hauled into court for conspiring to restrain trade. In the heyday of Andrew Carnegie and John D. Rockefeller, they got accused of fomenting violence and revolution. During the first decade of the Cold War, they had to purge their ranks of radical activists or be slammed as soft on Communism. Since the 1970s, they have been condemned as a greedy and privileged special interest even as their numbers and political clout keep dropping. Effective 1 January 2013, all engine service employees and assignments shall be governed by the terms and conditions of the Agreement between Wisconsin Central LTD. (WC) and Brotherhood of Locomotive Engineers and Trainmen (BLET). Certain modifications to that agreement will be in effect, pursuant to the Merger Implementing Agreement negotiated in relation to STB Finance Docket No. 35630. Union workers who were protesting the passage of so-called “right-to-work” laws outside the state capitol in Lansing, Michigan are “terrorists,” according to a former high-ranking official in the Republican Party of Virginia who now serves in a county-level elected office. This is concerning the Rinaldo Award - Standing Bid - Section 1 (B). Beginning with the COC on December 10, all vacation vacancies of seven (7) days or more will be filled with the Temporary Change of Card, not the Permanent Change of Card. Please notify your members. General Chairman Reynolds and BLET-VP Ruef will be in attendance to answer all questions. A showdown is taking place in Washington, D.C. Some Lawmakers are pushing to grant more tax cuts for the richest 2% of Americans at a cost of $1 trillion over 10 years while cutting Social Security, Medicare and Medicaid benefits under the guise of a manufactured fiscal crisis. Randal W. LeNeave and the union designated law firm of Hunegs, LeNeave Kvas welcomes all railroad union craft employees,spouses or significant others to attend an informative luncheon to learn about the rights railroad workers have under the Federal Employers Liability Act. "Employees from other crafts transferring into engine service shall retain any PLD entitlement previously earned." If an Engineer possessing Trainman seniority on or prior to January 1, 2012 and is permitted to exercise his seniority rights as a Trainman in the event he is involuntary furloughed from engine service, how many PLDs would he be entitled to? If an employee established seniority as a Trainman prior to January 1, 2012, he should be entitled to twelve (12) Personal Leave Days. submit a grievance claim in the CATS system. Its imperative that you enter the claim into the CATS system, as a paper trail is needed, as this office is attempting to resolve this issue. When submitting your claim in CATS, please use the language enclosed with this letter. Thank you in advance for your cooperation in this matter. Should you have any questions concerning this issue please contact your Local Chairman. President Obama has issued a letter to all BLET members thanking them for the recent endorsement for re-election to President. Your GCA has reached a tentative New York Dock (NYD) Implementing Agreement with CN providing for the coordination of the WC and EJ&E properties. This Agreement is very similar to the one that was promulgated last year by Arbitrator Rinaldo in connection with the coordination of the WC, DMIR and DWP properties. While this Agreement may not appear to immediately impact many of our present members, particularly those who are far removed from the Chicago area, it is important to everybody nonetheless. The final notes from the Labor-Management Resolution Committee notes have been completed. John W. Reynolds, General Chairman. From the CN Corporate Home Page: CN announced today that it is acquiring more than 2,200 new freight cars in 2012, as well as 1,300 new containers, to support traffic growth and improve customer service. Jean-Jacques Ruest, executive vice-president and chief marketing officer, said: CN is acquiring new freight cars and containers for a range of markets, including forest products, metals, minerals, coal, iron ore, steel, consumer goods, finished vehicles, and grain. These fleet additions will help us grow in line with our customers' demands and ensure CN has the right mix of modern, productive assets. CN and Superior Silica Sands today announced a multi-year agreement to move frac sand from a new processing plant now under construction in northern Wisconsin. Texas-based Superior Silica Sands is building an 85-acre sand processing plant and rail storage facility adjacent to CN's Barron Subdivision near Poskin, Wis., capable of producing up to 2.4 million tons per year of high-quality frac sand products. CN this spring launched a $35-million project to restore nearly 40 miles of track between Ladysmith and Barron, Wis. CN will upgrade rail and replace railroad ties, repair culverts and bridges, and restore rail service along the line. The Barron Subdivision will connect to CN's North American rail network at Ladysmith and will be in service later this year. CN will provide rail service to the new plant, moving frac sand from northern Wisconsin to shale drilling areas across North America, including Western Canada. On July 17, the Federal Railroad Administration and the U.S. Department of Labor Occupational Safety and Health Administration (OSHA) announced that they had reached a memorandum of agreement to begin working together to address the seriousness and overwhelming number of whistleblower complaints that OSHA has received from railroad workers. BLET National President Dennis R. Pierce applauded the announcement. OSHA has received nearly 1,000 whistleblower complaints in less than five years, President Pierce said. Thats more than 200 per year, or more than one every other day. Retaliation against railroad workers is an epidemic that has plagues our industry for years and I am pleased that problem is finally being addressed in a manner that I hope will bring an end to the decades old harassment and intimidation of rail workers. The Federal Railroad Administration (FRA) and the Occupational Safety and Health Administration (OSHA) today announced the signing of an agreement to improve coordination between the two agencies in enforcing the whistleblower provision of the Federal Railroad Safety Act (FRSA). from the General Chairman-CN/WC Members: This letter is to update you on the current Section 6 meetings we are involved in with the Carrier. As you all know by now we began our current round of negotiations with the Carrier in Roselle, IL on February 29 & March 1, 2012. Our second round of meetings was held in Minneapolis, MN on June 4 & 5, 2012. Our next meeting is scheduled for July 24 & 25, 2012 in Kaukauna, WI. I will keep you updated on the Section 6 meetings as they continue. Fraternally, John W. Reynolds, General Chairman. from the General Chairman-CN/WC Members: This letter is to update you on the current Section 4 meetings we are involved in with the Carrier. As you all know by now the Carrier filed paperwork with the U.S. Surface Transportation Board to merge the Wisconsin Central and Elgin, Joliet and Eastern as one operating railroad. The merger was approved by the U.S. Surface Transportation Board just last month. What this means is the Elgin, Joliet and Eastern Railway will officially be absorbed by the Wisconsin Central Railway. The EJ&E will cease to exist as separate corporations, and all operations would be as the Wisconsin Central. The two railways are now negotiating with the Carrier in hopes of moving all employees under a single contract. CN hopes to have the deal done by the end of the year. We have had one round of meetings, which were held in Homewood, IL on July 9 & 10, 2012. The next scheduled meeting is to be held in Homewood, IL on August 7 & 8, 2012. I will keep you updated on the Section 4 meetings as they continue. Fraternally, John W. Reynolds, General Chairman. President Pierce has released a letter concerning the FRSA/OSHA Whistle Blower Act in which the carriers have attempted to place there attorneys in the under the guise of "representing" the affected worker. Brothers: CN has formally notified this Committee of its plan merger of the WC and the EJ&E properties. An anti-union bill currently making its way through Congress seeks to undermine the rights of workers to bargain collectively under the guise of higher wages. The cynically-named Rewarding Achievement and Incentivizing Successful Employees Act, or RAISE Act, would amend Section 9(a) of the National Labor Relations Act (NLRA) to allow employers to ignore what they agree to in collective bargaining agreements. Introduced by Senator Marco Rubio (R-FL) as S. 3221, the bill would take away employees rights to negotiate contracts that create a uniform, fair process for granting wage increases. The dubious logic behind the bill is that employers are benevolent and generous supporters of their workers, and should be allowed the freedom to reward favored employees with higher raises. In reality, the legislation would give employers the ability to discriminate against employees by arbitrarily showing favoritism to one worker over another. from the office of the General Chairman--The CN/WC General Committee will address the following at the Labor/Management Resolution Committee meeting to be held on June 27 & 28, 2012. (CLICK HERE) to download the agenda. (CLICK HERE) to view claims scheduled for the LMRC. Diesel fumes cause lung cancer, the World Health Organization declared Tuesday, and experts said they were more carcinogenic than secondhand cigarette smoke. The W.H.O. decision, the first to elevate diesel to the known carcinogen level, may eventually affect some American workers who are heavily exposed to exhaust. It is particularly relevant to poor countries, where trucks, generators, and farm and factory machinery routinely belch clouds of sooty smoke and fill the air with sulfurous particulates. A new benefit year under the Railroad Unemployment Insurance Act begins July 1, 2012. Administered by the Railroad Retirement Board (RRB), this Act provides two kinds of benefits for qualified railroaders: unemployment benefits for those who become unemployed but are ready, willing and able to work; and sickness benefits for those who are unable to work because of sickness or injury. Sickness benefits are also payable to female rail workers for periods of time when they are unable to work because of pregnancy and childbirth. Please see the attachment concerning the Carrier's plans to merge the WC and the EJE railroads that was filed with the STB on Wednesday, May 23, 2012. I will keep you update as this progresses. John W. Reynolds, CN/WC General Chairman. Canadian National will likely reopen its 44-mile branch line from Ladysmith to Poskin, Wis., which has been dormant for several years. According to a CN operating bulletin taking effect May 14, the railroad is reestablishing the Barron Subdivision, connecting with the Superior Subdivision at Ladysmith. The bulletin says at present the main track is out of service west of milepost 129.0 at Ladysmith, and has a maximum speed of 10 mph. The line is part of Soo Lines original route from Minneapolis to Sault Ste. Marie, Mich., which CN inherited with its 2001 purchase of Wisconsin Central. CNs Barron Subdivision was shut down shortly after the CN purchase, CN would reopen the line because of booming frac sand business. The sand is in high demand for oil and gas exploration in three major U.S. areas, including the Bakken Formation in North Dakota and Montana, and other areas in Texas and Pennsylvania. Superior Silica Sands is planning to build a new sand plant near Poskin, Wis., on the CN line. Another company, Canadian Sand and Proppant, has already broken ground for a new frac sand mine at a nearly 200-acre tract in the town of Sumner, not far from CNs tracks at Canton, Wis. The Federal Railroad Administration (FRA) published Safety Advisory 2012-02 on April 25 to remind railroads and their employees of the importance of complying with restricted speed operating rules. BLET National President Dennis R. Pierce strongly condemned the "blame the worker" tone of the Safety Advisory. He warned BLET members to be on alert for "...increase the level of operational testing with regard to the operation of trains on main tracks at restricted speed." News Flash from the BLE&T--Express Scripts recently finalized its merger with Medco Health Solutions, the prescription drug provider to many BLET members. The combined company will be Express Scripts and will continue to provide pharmacy services to BLET members without changes to the plan or network. On April 16, 2012, the BLET National Division posted a News Flash article at www.ble-t.org warning our membership of the attack on our Railroad Retirement system that was included in Republican Budget Committee Chairman Paul Ryans Budget Plan. Since that time, the National Division has received many calls and emails from the membership, many of them curious as to exactly where in the Ryan Budget those attacks were found. To that end, I am including in this message an exchange that I had this week with a member, in this case a member that I have known personally for over 30 years. This Brother questions BLETs facts, as was his right; unfortunately he also chose to question our motives. While our union is big enough for all opinions, it is imperative that we not get sidetracked when it comes to who is attacking working Americans, and what your National Division is doing to defend our way of life. My response sets the record straight on both accounts, and is shared for your information. From the BLE&T Web Site--The U.S. House of Representatives has adopted federal budget legislation sponsored by Budget Committee Chairman Paul Ryan (R-WI) that would have devastating effects on the retirement security of both active and retired BLET members, as well as all railroad workers. The measure passed on March 29 by a vote of 228-191, with 10 Republicans joining all of the Democrats in voting against it. The Ryan Budget fundamentally misconstrues the relationship between Railroad Retirement and Social Security, and ignores the fact that all Railroad Retirement benefits above Social Security whether Tier 1 benefits or Tier 2 benefits are fully funded by railroad workers and their employers; none of these benefits are funded from the general treasury. Therefore, no actual budgetary savings would result from enactment of this legislation. "The Ryan Budgets claim that American taxpayers will realize a savings if our occupational disability and retirement annuities are gutted is so blatantly false," BLET National President Dennis R. Pierce said, "that even the head of the carriers lobbying group has called out Chairman Ryan on his deception, and told him not to interfere in our privately-funded industry pension." "This budget is one more example of how Republican Paul Ryan and his worker-hating allies are trying to hurt middle class Americans including the railroad workers who, with the carriers, fully fund their own pension plan," BLET Vice President & National Legislative Representative John Tolman said. "Also included are the standard targets Amtrak and its workers and high speed rail, by eliminating funding for high speed rail and limiting overtime for Amtrak workers. But the cuts aren't limited to only railroad workers." TCU has filed charges of discrimination with the Equal Employment Opportunity Commission (EEOC), challenging Burlington Northern Santa Fe (BNSF) Railroads new policy on reporting medical events or conditions. 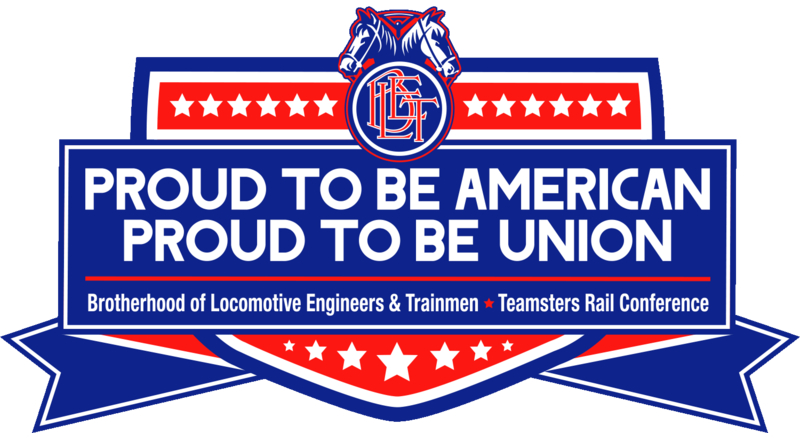 The Brotherhood of Locomotive Engineers and Trainmens Advisory Board has adopted revisions to the Unions program that provides assistance to BLET members injured on the job, who may be entitled to damages pursuant to the Federal Employers Liability Act (FELA). In the wake of five rear-end collisions in 2011, the National Transportation Safety Board (NTSB) has issued safety recommendations regarding the operation of freight trains at restricted speed. Two BLET members were killed in those accidents. According to preliminary investigations into the five accidents, the NTSB blamed crew members for going too fast and failing to operate their trains at the required restricted speed. A dispute currently exists with the Carrier regarding the proper application of the Agreement to situations where away crews at Chicago are not being properly compensated in instances where their travel time between the lodging facility and their purported on/off duty location exceeds thirty (30) minutes, crews are required to perform covered service at the lodging facility or enroute to or from the purported on/off duty point, and/or crews are not provided lodging within 30 minutes of going off duty. BLET President Dennis R. Pierce has written a letter to Presient Obama about "The F.R.A. Reform and Modernization Act" as it is currently written. Canadian National Railway Co. has suspended Hunter Harrisons pension payments, alleging that the former chief executive officer has breached provisions of his retirement deal and poses a serious threat to CN if he joins rival Canadian Pacific Railway Ltd.
From the BLE&T Web Site--I. R. S. regulations require the BLET National Division to inform its members that a certain portion of your National Division dues are not tax deductible as a miscellaneous itemized deduction on your personal tax returns. According to the National Secretary-Treasurers office, the portion of the National Division dues that is not subject to deduction as an Itemized Deduction on a Form 1040 tax return is 13.56 percent for 2011. In other words, 86.44 percent of your BLET National Division dues are tax deductible. The 13.56 percent reflects expenses associated with political lobbying efforts by the BLET, which are not tax deductible. Hunter Harrison, the former head of Canadian National Railway Co., has been approached as a possible candidate to take over the helm of his former rival, Canadian Pacific Railway Ltd. and he is apparently receptive to the move, sources familiar with the plan have confirmed. 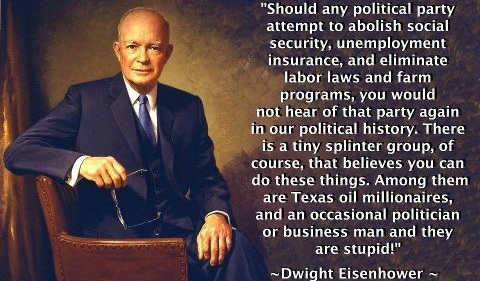 Here is another episode of the tail wagging the dog or in other words the 1% vs the 99%. Please pour yourself another cup of java and sit back and read the attachment concerning the top 30 companies lobbying Washington versus what they actually pay in taxes. It is astonishing and makes for a very compelling argument as to who is actually running the country. Couple that with the recent changes to the political donations scams and you have a recipe for a national disaster (or more of a one) when it comes to the middle class. Finally, this one article provides even more insight as to why we are now entertaining the tentative agreement and healthcare changes and why organized labor, in general, is constantly fighting an uphill battle. Final rule making by the FMCSA prohibits use of a cell phone while operating a motor vehicle (unless its hands free). The General Chairman has released a letter to the Carrier concerning the proper application of the Agreement to situations where away crews at Chicago are not being properly compensated for travel time between the lodging facility and their purported on/off duty locations. By Dennis R. Pierce BLET National President--Exactly two weeks ago an excerpt from my Presidents Message in the Oct/Nov. issue of the Locomotive Engineers and Trainmen News was published on this website. I told you that the issuance of PEB 243s report and recommendations had placed both the BLET and the Carriers at the point where either they had to reach a voluntary settlement or allow a third party to set our wages and working conditions. From the BLE&T Web SiteWatco Transportation Services, L.L.C. (Watco) and The Wisconsin & Southern Railroad Co. (WSOR) announced today that they have mutually approved an agreement whereby Watco will acquire controlling ownership of the WSOR. The WSOR will join forces with Watco, who operates a family of short line and regional railroads across the nation and offers a multi-faceted transportation business model dedicated to providing the highest level of Customer satisfaction. November 29, 2011 Kaukauna WI - Results of the claims conference that was held in Kaukauna, WI on November 8, 2011. Presidential Emergency Board No. 243 has issued its Report to President Obama and its recommendations for settlement of the national wage/rules/benefits dispute between 11 unions, including the Brotherhood of Locomotive Engineers and Trainmen (BLET), and most of the nations Class I railroads. In some ways the PEB recommended adoption of some of the Carriers arguments that the United Transportation Union (UTU) settlement be followed but in other ways it modified those terms to give the employees represented by the other unions a more generous settlement. In its presentation to the Board, the Carriers argued that the UTU settlement was a pattern that should be adopted lock, stock and barrel. The PEB did not agree and its recommendation does not strictly follow the Carriers demands. For example, the general wage increases proposed by the Board are greater than those found in the UTU agreement. In addition, the Board has recommended a lump sum signing bonus for all employees covered by the agreement, while the UTU agreement only pays lump sums to employees working under the entry rate progression that UTU had previously agreed to. Dear Sirs and Brothers, The purpose of this letter is to update you on the status of the negotiations that have been ongoing in an attempt to make an Implementing Agreement pursuant to the New York Dock Protective Conditions in response to the notice dated May 18, 2011 CN served to coordinate the WC, DMIR and DWP properties. The Parties (BLET, UTU and CN) met in person June 21 and 22, 2011 in Duluth, MN; July 13 and 14, 2011 in Minneapolis, MN; and August 24 and 25, 2011 in Green Bay, WI. Additionally, the Parties conducted conference calls on September 30th and October 7th, 14th and 20th, 2011. To date, no Implementing Agreement has been reached. At the conclusion of the meeting held on July 14, 2011, the Carrier announced its intention to seek arbitration pursuant to Section 4 (a) of the Conditions, which provides that: "If at the end of thirty (30) days there is a failure to agree, either party to the dispute may submit it for adjustmentâ€¦" The Carrier thereafter sought a strike list from the National Mediation Board and as a result of that process, Arbitrator Thomas Rinaldo was selected. The Parties will appear before Arbitrator Rinaldo in Albany, NY on October 27, 2011 to present our arguments. I will represent the GCA and be assisted by our assigned National VP, Marcus Ruef. Arbitrator Rinaldo will issue an Award in connection with this matter in due course, and we will keep you up to date on future developments as they occur. We just received the Executive Order, signed and released by President Obama, appointing a Presidential Emergency Board to hear our dispute over our National Negotiations. It is attached. Please pass this information to your Division Strike Committees, this email will also be circulated by the Mobilization Network. Effective immediately, both the Carriers and the Unions are barred from exercising any form of self help. Accordingly, the BLET National Division will not be issuing any strike orders tonight. To reiterate, all locomotive engineers and involved trainmen should continue to work their assignments in normal fashion, there will be no strike at 12:01 am. In closing, I know that you were all prepared to assist the National Division in leading our members in a job action had it been necessary and legal. Please remember that the attached Executive Order effectively bars us from any form of self help until December 7, 2011. During the next 60 days, it is imperative that we continue our effort to strengthen our networks and remain vigilant to the fact that we may face circumstances similar to todays on December 7th. I speak for all of us here at the National Division in passing on our thanks for everyones continued support in our efforts to bring this bargaining round to a successful conclusion. The following claims were filed for Arbitration to be heard by the First Division on March 15, 2011. The National Mediation Board ordered the BLET and the Carrier to try and resolve the claims through Alternative Dispute Resolution (ADR). At this time we have had one ADR meeting in Washington, DC with mediator Pat Sims. The second letter for posting is a protest concerning engineers being forced to allow student engineers to run the train. Please (CLICK HERE) to view this letter in PDF format. On Friday September 2, 2011, the National Mediation Board (NMB) urged the unions comprising the Rail Labor Bargaining Coalition (RLBC) and the carriers represented by the National Carriers Conference Committee to submit their unresolved national contract dispute to binding arbitration pursuant to Section 5, First and Section 7 of the Railway Labor Act, as amended (RLA). The proffer of arbitration is a mandatory step in the RLA bargaining process. If either party to the negotiations declines to accept the proffer, the NMB will then notify the parties that its mediatory efforts have failed and will release them from mediation. By letter dated September 2, 2011, all unions comprising the RLBC notified the NMB that the RLBC was rejecting the proffer of arbitration. This rejection will release the parties from mediation and will also trigger a final 30-day cooling off period, after which the parties will legally be entitled to exercise self help. What really is the result of what has happened here in Wisconsin? August 29, 2011 Kaukauna WI - Here is an update on our recent Section 4 meeting held in Green Bay, August 24 & 25.
from the General Chairman--This letter is to follow-up on our recent New York Dock Sec.4 meetings with the Carrier that were held on August 24th & 25th in Green Bay, WI. In attendance at this meeting were General Chairmen Keith Stauber and Ricky Clark representing the DMIR GCAs, UTU-E General Chairman John Wentzlaff and First Vice Chairman Steve Moerke representing the DWP UTU-E GCA. BLE National Vice Presidents Marcus Ruef representing the BLET National Division. First Vice Chairman Eric Hau, Second Vice Chairman Scott Reinke and myself representing the WC GCA. We offered a proposal to the Carrier hoping to achieve a voluntary agreement to both satisfy the Carriers New York Dock Section 4 Notice. As stated in earlier messages to you, if we cannot reach a voluntary agreement regarding the Section 4 Notice, the Carrier intends to invoke Arbitration pursuant to New York Dock. If this happens, an Arbitrator will impose an Implementing Agreement upon us. The Carrier intends to meet with the three GCAs on September 7th & 8th in Superior, Wisconsin in hopes of moving all employees under a single contract. The Carrier has also indicated, and you may hear through other channels, that they intend to file for arbitration shortly so that the arbitration process will be in place should the Parties fail to reach a voluntary settlement. This should not be interpreted as a sign that a voluntary settlement cannot be reached short of arbitration. I will keep you up-dated on the Section 4 meetings as they continue. Fraternally, John W. Reynolds, General Chairman. From the Hoey & Farina's e-mail Newsletter for Railroaders: The U.S. Department of Labor, Occupational Safety & Health Administration, issued an order on July 15, 2011, in a "Whistleblower" complaint filed by a Wisconsin Central (CN) Railroad Conductor pursuant to Section 49 U.S.C. 20109 of the Federal Rail Safety Act. The Conductor reported an on the job injury, as required by railroad rules, on January 30, 2010 which under the statute is a protected activity. The following day the railroad issued a notice ordering the Conductor to attend a Formal Investigation to ascertain his responsibility for sustaining a personal injury and to ascertain if he violated any railroad rules. July 19, 2011 Kaukauna WI - Here is an update on our recent Section 4 meeting held in Minneapolis, Minnesota on July 13 & 14. This letter is to follow-up on our recent New York Dock Section 4 meetings with the Carrier that were held on July 13th & 14th in Minneapolis, Minnesota. In attendance at this meeting were General Chairmen Keith Stauber and Ricky Clark representing the DMIR GCAs, UTU-E General Chairman John Wentzlaff and First Vice Chairman Steve Moerke representing the DWP UTU-E GCA, BLET National Vice Presidents Marcus Ruef and Michael Twombly representing the BLET National Division, First Vice Chairman Eric Hau, Second Vice Chairman Scott Reinke and myself representing the WC GCA. We exchanged proposals with the Carrier hoping to achieve a voluntary agreement to both satisfy the Carriers New York Dock Section 4 Notice and also enhance the BLET/WCL Agreement. As stated in earlier messages to you, if we cannot reach a voluntary agreement regarding the Section 4 Notice, the Carrier intends to invoke Arbitration pursuant to New York Dock. If this happens, an Arbitrator will impose an Implementing Agreement upon us. The Carrier intends to meet with the three GCAs on August 24th & 25th in Green Bay, Wisconsin in hopes of moving all employees under a single contract. The Carrier has also indicated, and you may hear through other channels, that they intend to file for arbitration shortly so that the arbitration process will be in place should the Parties fail to reach a voluntary settlement. This should not be interpreted as a sign that a voluntary settlement cannot be reached short of arbitration. I will keep you up-dated on the Section 4 meetings as they continue. This letter is to up-date you on the current Section 4 meetings we are involved in with Carrier. As you all know by now the Carrier filed paperwork with the U.S. Surface Transportation Board to merge the Wisconsin Central, the Duluth, Missabe and Iron Range Railway and the Duluth, Winnipeg and Pacific Railway as one operating railroad. The merger was approved by the U.S. Surface Transportation Board just last month. What this means is the Duluth, Missabe and Iron Range Railway and the Duluth, Winnipeg and Pacific Railway will officially be absorbed by the Wisconsin Central Railway. The DMIR and DWP will cease to exist as separate corporations, and all operations would be as the Wisconsin Central. The three railways are now negotiating with the Carrier in hopes of moving all employees under a single contract. CN hopes to have the deal done by the end of the year. We have had one round of meetings, which were held in Superior, WI on June 21st & June 22nd. The next scheduled to be held in Minneapolis, MN on July 13th & 14th. From the Hoey & Farina's e-mail Newsletter for Railroaders--On June 23, 2011, the Supreme Court of the United States issued its decision in the case of CSX Transportation, Inc. v. Robert McBride. The decision reaffirms the established causation jury instruction under the Federal Employers' Liability Act (FELA). For over 50 years, virtually every court in the United States followed the language of the law contained in the FELA as written by the U.S. Congress when instructing juries on the standard of causation that applied to. The CSX railroad argued that this was an incorrect standard of causation ('proof') - and appealed. CSX lost its appeal, then asked the Supreme Court of the United States to review the decision. From the News Wire Trains Mag.--A major mining company has proposed an 8-million-ton-per-year mine and processing plant for iron ore near Canadian Nationals Ashland Subdivision, the Duluth (Minn.) News-Tribune has reported. If opened, Cline Groups Gogebic Taconite plant would be the first ore operation on the Gogebic Iron Range since the 1960s. At full planned production, the plant would produce enough ore to fill approximately two 12,000-ton unit trains of ore per day. Like ore from other plants near the Great Lakes, it would ship by rail to an ore dock, then be transferred to lakeboats. Cline is also looking at production of iron nuggets, a more refined, higher-grade ore that can be used in electric arc furnaces. From the office of the General Chairman: Attached with this notice is a letter to the membership explaining when they submit a grievance claim in CATS they need to include the Article number of the CBA with the violation. ENROLLMENT IS STILL AVAILABLE TO ALL ENGINEERS AND CONDUCTORS WHO WISH TO ENROLL IN THE GENERAL COMMITTEE'S SUPPLEMENTAL INSURANCE PLAN. SINCE OPEN ENROLLMENT IS OVER, YOU MAY BE REQUIRED TO TAKE A PHYSICAL. IF YOU'RE ONE OF THE NEW ENGINEER TRAINEES, ONCE YOU QUALIFY, YOU WILL BE ABLE TO SIGN UP WITHIN 30-DAYS FOR OUR PLAN WITHOUT A PHYSICAL. ENROLLMENT PACKAGES WILL BE MAILED TO YOU OR CONTACT CORNERSTONE ASSURANCE GROUP, AGENT FOR DETAILS. This is a private website for the Brotherhood of Locomotive Engineers and Trainmen, CN/Wisconsin Central General Committee of Adjustment and its members. Any duplication of any images, text or other information on this site without the expressed written consent from the administrator is strictly prohibited! Any and all violations will be prosecuted to the fullest extent of the law! Access to portions of this website require a username and password issued by the Administrator, only authorized users will be granted access. Unauthorized access will be reported, Computer Fraud is a crime and all violations will be prosecuted to the fullest extent of the law. Please contact the administrator at: admin@bletcnwcgca.org with any issues regarding this website.